Cool and contemporary, Wyler House was designed and built by the renowned Italian architect Paolo Piva in 2006. 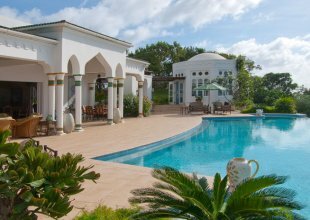 A chic villa fabulously positioned in Endeavour Bay, its just a walk to sandy beaches and the famous Cotton House Hotel with its award winning Veranda Restaurant, Spa and Beach Cafe. The tennis courts, yachting port are also within easy reach. 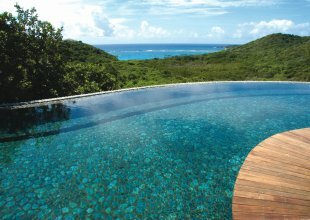 From almost every vantage point, there are breath-taking panoramic views sweeping across tropical vegetation to the sparkling Caribbean waters and the North Grenadine Islands beyond. The property itself encompasses luxurious indoor and outdoor living and embraces its tropical surroundings. Built of natural wood and stone it has several sliding glass doors, allowing the sea breeze to sweep through the villa. The tropical climate is embraced at Wyler House with its wonderful variety of indoor and outdoor living and dining areas - also providing plenty of space with idyllic places for guests to retreat to. Guests of all ages will adore the massive 30 metre swimming pool with bridge going over it, sun deck and the shaded verandahs all facing the golden sands and sparkling waters. The gym and media rooms are fully equipped and have underwater viewing windows of the swimming pool. There are three large bedroom suites, each equipped with air conditioning and private en-suite bathrooms. Every bedroom walks out to its own side of the covered patio.